The ban was first imposed at the start of 2007 for statutory no-smoking areas. A blanket ban on smoking in all indoor public places was introduced on July 1 last year. “The government has seen fit to pass a smoking ban, yet do not maintain a level playing field, with only random enforcement,” J. R. Robertson, managing director of El Grande Holdings, said. The company has a number of bars and restaurants in the city, including the East End Brewery bars in Causeway Bay and Quarry Bay, which have been badly affected by the smoking ban. The bar in Causeway Bay has been the worst hit, with a 35 per cent drop in profit. Kevin McBarron, owner of the Canny Man in Wan Chai, said he would have kept his customers if they knew that they couldn’t go around the corner to another bar to smoke. McBarron said his business was down 40 per cent compared to the previous year and he has had to lay off two staff members. Stanley Lam, manager of the Dickens Bar in the Excelsior Hotel, said business was down at least 20 per cent. “It’s not fair when other bars can ignore the smoking ban, but we can’t do anything about it,” he said. The Tobacco Control Office said it does not conduct random checks and only responds to a specific complaint. “We conduct investigations and unannounced inspections, including overnight operations, weekends, and holidays, in response to complaints. From time to time we also conduct joint operations with the police,” a Department of Health spokesman said. The Sunday Morning Post visited bars in Causeway Bay and Tsim Sha Tsui last week and found customers and staff smoking freely. One owner of a TST bar was happy to let people smoke because he was not breaking the law. A Causeway Bay bar owner said it was all down to culture. “It is part of our Chinese lifestyle to smoke. Cigarettes are cheap in Hong Kong and it’s how we socialise, nothing will change this. I don’t care if people light up inside my premises because they are all good customers – there won’t be any complaints,” he said. The government has proposed measures to tackle smoking in the city, including limiting the number of duty-free cigarettes that an arriving traveller can bring in to 19. 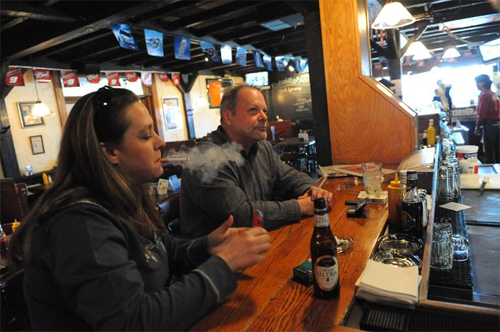 Some bars in central areas flout the smoking ban. In places such as Central and Wan Chai, smokers stand outside premises, but even inside these places people are lighting up because the owners are happy to turn a blind eye. This happens in establishments above ground level. Instead of going down to the street to light up, customers are allowed to smoke in corridors or out of windows to save the hassle of going outside. The Tobacco Control Office said that between July 1, 2009, and January 31, 2010, only seven summonses have been or will be issued for smoking in bars; in addition, 53 fixed-penalty tickets have been issued. The office has 99 tobacco control inspectors to enforce the smoking ban. People caught smoking must pay a HK$1,500 fine within 21 days. Posted in: Bar, Cafe, Night Club, Passive Smoking, Restaurants, Smoking Ban. I hate smoking, I hate the ones who don’t care!